I will always remember the screams, the untold billions of screams. The cries of the damned reverberated off the canyon walls. The sound of their wails stretched over miles with each moaning breath mingled into a cacophony of pitiful, tortuous laments. I beheld in fascinated horror as billions upon emaciated billions of humans and Elohim languished in agony. Their rotted and burning flesh stank as the winds made the hellish perfume waft across the skies, causing the air to reek with putrefaction. Blistering heat sizzled from the white-hot lake of molten rock, and fire licked and bit at each captive’s smoldering flesh. Flesh forever burned but never consumed. Therefore, they screamed the residents of this canyon did –– it was a sickening sound. Is this how Moses felt? I wondered. To behold a thing that burns but is not consumed? “Please make it stop,” said one. “I am sorry, oh God! Please, God! Listen! Jesus, do you hear me,” said another. The voices melded and flowed, morphing into a singular pitiful cry for relief and anguish. I watched as some fought to climb atop others in a futile struggle to escape the horrifying affliction. It was a fruitless skirmish from which none could expect release. I suppose that it could be possible to flee. I saw neither bars nor chains to hold these souls captive. Straining and squinting, my angelic eyes viewed no doors that would prevent escape. Selfish preservation run amok, pain, and hopelessness prevented them. As one soul approached optimism and the border of freedom, another wretch dragged it back within the bowels of smoke and flames. The grotesque scene of twisted, writhing bodies, moved as the tide in this sea of fire and brimstone. I observed them dance, the denizens of this canyon. Dance a relentless waltz of hope deferred. For there was no respite to soothe one’s pain, no aid to come to one’s side. None could leave, and salvation had forgotten this place. The Lake of Fire consumed each incarcerated soul held captive by the insatiable passions of lust and self: a twofold punishment forever administered on these prisoners for all time. A memorial by El, forever to be remembered by us all. The lake was an eternal smoldering monument of our war: a token of El’s wrath upon all those who had held back the truth in unrighteousness. My eyes were older than much of creation, and as they darted over the vastness of this everlasting torture, I remembered when I first saw the flames of the Kiln run amuck. Yet even now, I found that I looked for him: my beloved, my brother, my friend, and my enemy, he whom my soul delighted. I stood at the precipice of this jagged maw in the Earth’s crust of heat, smoke, and fire. I strained that I might see the Adversary. It has always been an easy thing for a creature such as I to find my own kind, and with Lucifer even more so –– quite easy actually. Knowing my brother, I needed only to look towards the heart of this mass grave of the spiritually dead. He was still a creature of pride, and even here, even after all this time, Lucifer sought to be the center of all things. He smirked as he looked at me, but I am not deceived. I know that joy does not dwell in this place. 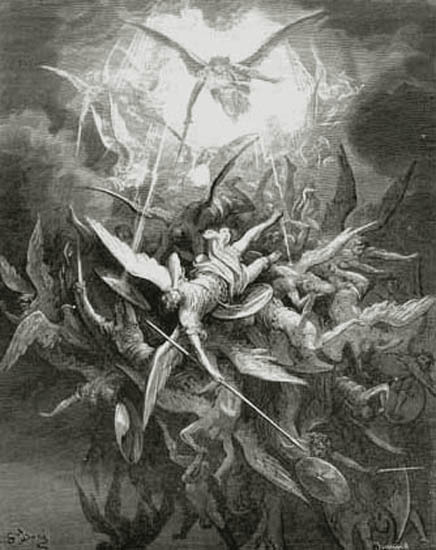 The human Dante was prescient when he penned, “Hope had abandoned all those that entered here,” here in the Lake of Fire, even Hell herself could not flee. Lucifer’s face I knew with intimate familiarity. The smirk on his lips masked an unspoken yet seething hatred from the inner knowing that he was “superior” to all in creation, elevated to stand in the very presence of God, yet cast down as rubble to be stared and looked upon, a creature to be pitied. Oh how art thou fallen O Lucifer son of the morning. How art thou cut down to the ground, which didst weaken the nations. It was this knowing, which I knew forever would gnaw at him the reason for his smirk. Our gaze was short as smoke enveloped him, yet through the veneer, yes, I saw it–– a tear. Then he was gone; veiled in smolder and fire; and pummeled by the legions he once sought to rule. Forever crushed underfoot by those, he deemed chattel, forever humiliated. Never in all my days did I believe my eyes would behold such a sight. I turned away as I could behold such suffering for only so long. Even one such as I had limits. I am relieved that the war is over. The kingdoms of this world are become the kingdoms of our Lord, and of his Christ; and he shall reign forever and ever. This victory was not without loss, not without pain. Lucifer’s voice could not be mimicked or masked. There was one being in creation that sounded thus. Only he could speak so that even from the Lake of Fire my attention could be garnered. I am hesitant to reply. I do not wish to look upon this murderer. We will not speak again after today: I know this; therefore, I turned to face him for the last time. As I looked upon his face and body now disfigured, I steeled myself. There was a time when I shed tears for my brother, but that was millennia ago. Too much blood had been spilled between us, too many wounds. Mercy no longer beat within my breast for him, yet even now, I could not help but ruminate on more pleasant times. I drifted into reflection, and daydreamed back to the beginning of it all––still questioning––still wondering. If you want to read more check out Chapter One! Google-Fu: and the way of the Net:How to understand the information the Net has about you, and influence it. Greetings grasshopper: sit to understand the way of the “Net”. For the internet, is a vast computer network storing and sharing a wealth of information. This network has created the phenomenon that we call the World Wide Web. Ahh but this you know; patience grasshopper––patience. The Net is most voracious in its ability to swallow information, and is unforgiving in displaying its wares. For this purpose reader-san: you must understand the art of Google-Fu. Google-Fu is learning what information the Net knows and particularly knows about you. To do this you must understand what drives the Nets need to know you; and then––you must know yourself. You must know this reader-san or you will falter when your identity is stolen, or when girlfriend or employer sees your indiscretions on Facebook. Then you will pine for Google-Fu to protect you but by then it will be too late. Young pupil, appreciate and master the Net. Only with this knowledge will you come to understand its power. For the Net is like the air: it surrounds us, refreshes us or levels our relational houses. Know this and you will not know defeat in your affiliations. We will discover together the information the Net has captured about you. How you have surrendered this information and may recover yourself from disaster should you choose to walk the path of the wise. Therefore, reader-san, start with this truth: the Net knows only two things: one: what it has been given, and two––what you have given to it. Dwell on this truth grasshopper, next week we will begin your training, and start with what has been given to the Net. The Third Heaven: Burn Heaven…burn. The Third Heaven: The Rise of Fallen Stars is book one in a three part series that tells the fascinating story of the fall of Lucifer. God’s perfect creation; a being who dwelled in his very presence, walked in the midst of the stones of fire. Yet rose up to betray the Lord and bring heaven itself to civil war. What could go so horribly wrong that an angel would seek to usurp God? No monies are being made from this video.